Even a Trekkie as well-versed in production lore as this one found the new documentaries full of never-before-told anecdotes. The most intriguing is the 3-part feature, "Resistance is Futile," in which writers Ira Steven Behr, Ronald D. Moore and Rene Echevarria—a trio of writers hired by Piller that season—share frank stories about the no-nonsense Piller; their frustrations with writing under some of the constraints put in place by Star Trek creator Gene Roddenberry; and the turmoil caused by the bruised egos of the previous seasons' scribes, all slowly pushed out by Piller and his new staff. Behr and Moore, now seasoned executive producers in their own right, are particularly unfettered by show politics now that their association with the defunct show is decades behind them. 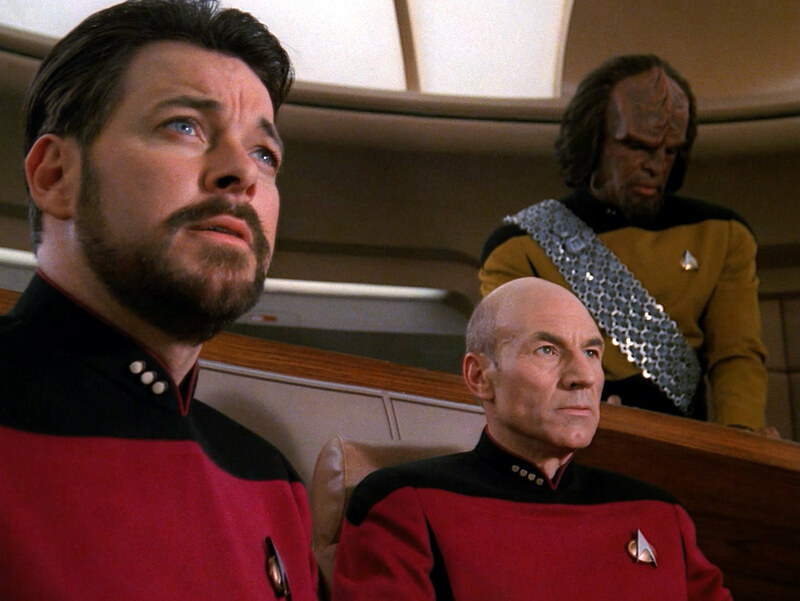 Behr recounts how he was forced to rewrite his well-received teleplay in which Captain Picard (Patrick Stewart) contemplates whether he should accept a promotion to the admiralty. Roddenberry wanted Picard to visit a pleasure planet instead, a fact that irked Behr because he knew the limits of TV censorship would prevent the display of provocative eroticism with any kind of teeth. The minor controversy soon became a big deal when Behr was asked to lunch by Stewart himself... after Behr had already modified the show. Stewart made sure the writer knew he wanted scripts where Picard would do more "screwing and shooting" as Moore puts it in another similar account. Surprisingly, the writing staff still found ways to wring drama out of scripts that were required to subscribe to the puzzling edict set by Roddenberry: in the future, humans have evolved past conflicts among themselves. In a funny, illuminating panel moderated by celebrity fan Seth McFarlane (Family Guy), Moore, Echevarria, and writers Brannon Braga and Naren Shankar discuss the ways they did this beginning with a run of stellar episodes in season three. Conflict had to be brought in from outside of the familiar crew at the center of the show. But it still had to impact at least one of the show's protagonists directly. Echevarria's spec script, "The Offspring," posited a daughter for the popular android Lt. Commander Data (Brent Spiner). Her controversial conception would place Data in a custody battle against an admiral seeking to confiscate her for the purpose of scientific research. "Sarek" brought back a beloved character from the original series, Spock's father, now suffering from a form of Vulcan Alzheimer's that projected his uncontrollable primal emotions onto those around him, causing savage fights to break out among the Enterprise crew. Most emblematic of the third season and its staff's ability to turn the tumultuous atmosphere offscreen into great drama onscreen was "Yesterday's Enterprise." A series standout, this episode started out as two separate scripts, a feature-length submission from production assistant Eric Stillwell and a spec screenplay from Trent Christopher Ganino. 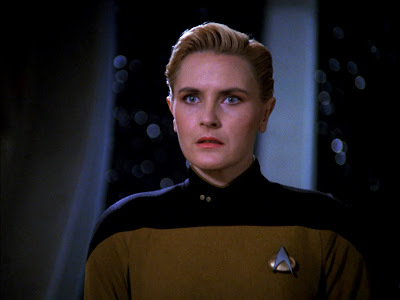 Together, the new story contained familiar elements from the original 60s show—Sarek (Mark Lenard), Harlan Ellison's Guardian of Forever—fused with new elements like the reappearance of the late security chief Tasha Yar (Denise Crosby). The entire staff took a crack at reworking the episode into something inexpensive to produce yet powerful. They succeeded. "Yesterday Enterprise" depicts a timeline altered by the emergence of a 20-year-old Enterprise from a temporal rift. 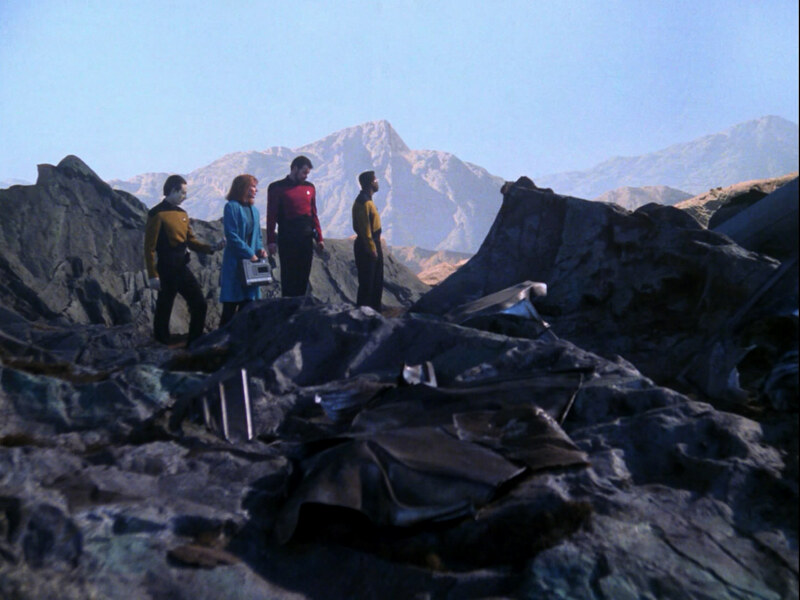 Because of the ship's disappearance in the past the Federation was plunged into a decades-long war with the Klingons. Yar is still alive and in the position normally occupied by the Klingon security officer Worf (Michael Dorn), now absent. But the Enterprise's clairvoyant barkeep, Guinan (Whoopi Goldberg), senses something is off, and presses Picard to send the other Enterprise back to certain destruction in the past in order to restore their present timeline. 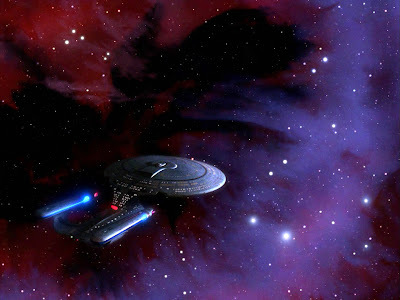 Dark and downbeat, "Yesterday's Enterprise" is a strong influence on the new, altered Star Trek chronology in J.J. Abrams' current iteration of the franchise. 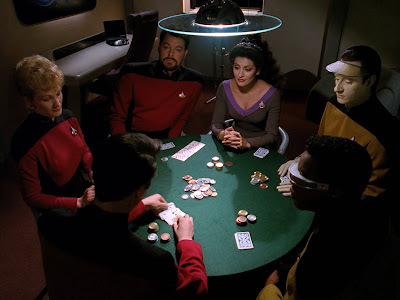 And the episode was the first of a winning streak of episodes that would lead up to the powerful Borg cliffhanger reviewed here last week. The new Blu-ray looks as great as one would expect, but it also serves to remind us of just how long it took for Star Trek: The Next Generation to click with viewers... three turbulent years. The series had outlasted its predecessor's time on the air. Now it was time to see if the consistency arrived at through hard fought behind-the-scenes battles could be maintained in its fourth season.